Earlier this month, director and author Amir Reza Koohestani premiered Die Attentäterin (The Assassin) at the Kammerspiele. Following his lyrical production Der Fall Meursault – Eine Gegendarstellung, Koohestani stages an adaptation of “The Attack”, a novel by Algerian writer Yasmina Khadra. First published in 2005, the book caused quite a stir as it attempted to provide insight into the mind of a terrorist. Dr. Amin Jaafari, a Palestinian-Israeli citizen, works as a surgeon at a hospital in Tel Aviv. Fully integrated and respected by his colleagues, he is considered for a promotion to hospital director. But on the night of another deadly bombing in Tel Aviv, the body of Jaafari’s wife Sihem is found among the dead. When the police announce that Sihem was responsible for the bombing, the doctor’s world collapses. He is accused of being an accessory to murder and loses his job. Torn between memories of their years together and the realization that his beloved wife led a double life, far removed from the rather comfortable, assimilated existence they shared, Jaafari starts to investigate why Sihem decided to commit this atrocious act. He returns to his family in Bethlehem where Sihem’s action is admired as an act of martyrdom. Jaafari is caught between two stools. He does not belong to either side, he is an outsider – a careerist to his Palestinian family, a likely accessory to murder to his Israeli colleagues who expect him to condemn his wife’s action. The dead assassin plays a very important role in Koohestani’s production. Reduced to a mere head by the explosion, Sihem (Mahin Sadri) appears as a ghost throughout the performance whilst Koohestani explores why women commit suicide bombings – out of unrequited love or admiration for a military leader or should they be seen as acts of feminism against a patriarchal society, an act of liberation. 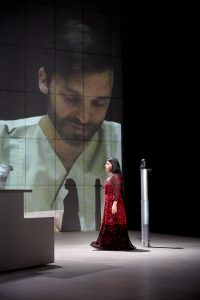 The stage is dominated by a long table with two cameras fastened to columns that rotate around the table projecting close-ups of the actors onto a large screen (design by Mitra Nadjmabadi). Amin Jaafari (Thomas Wodianka) and his friend Naveed (Benjamin Radjaipour) are having a break, discussing who has “the biggest”, Arabs or Israelis. They have been friends ever since Amin amputated Naveed’s leg after a female suicide assassin blew herself up next to Naveed. When asked about his wife, Amin replies that Sihem is visiting relatives behind the wall, therefore he hasn’t been in contact with her for the past three days. Amin never visits Bethlehem, where he grew up. After another bomb explodes, Amin and his colleagues hurry to the operating theatres to tend to the wounded survivors. Once the identity of the assassin is determined, Shin Bet operative Moshe (Samouil Stoyanov) interrogates Amin with cold efficiency. The small cameras fastened to the table suddenly take on a different meaning and one thinks of a police state, a feeling that is reinforced by a text projected onto the stage informing us about surveillance methods by the Israeli government. Koohestani does not offer a solution to the middle eastern conflict, nor does he support either party. Instead he tries to draw a balanced picture of the conflict and condemns those who are responsible for this unspeakable suffering. Koohestani emphasises that often the victims of this conflict are children. The production is divided into an Israeli an md a Palestinian part with most of the cast playing both Israeli and Palestinian characters. Walter Hess has one of the strongest scenes as Yehuda, grandfather of Amin’s best friend Kim (Maja Beckmann), a Holocaust survivor who describes his experiences as a 4-year old boy in dark poetic images. Later, Walter Hess appears as Amin’s grandfather Sheikh Marwan.